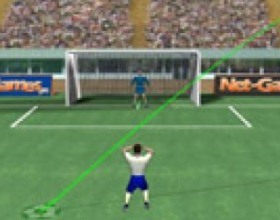 Your task in this fun game is to throw the goalie around and try to save as many goals as possible. Use mouse to click a body part, and drag it to a direction and release. You get one jump for every ball kicked at you. Your objective in this fun sport game is to score a goal in all 10 levels. Use mouse to move the player inside the semi circle to set direction and power of the shoot. Click the mouse button to shoot the ball. Be sure to check the wind direction before the shoot. 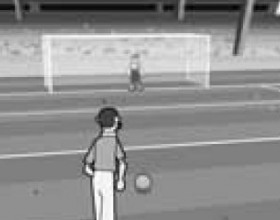 When you score a goal, click the Next button to play the next level. You can miss the goal only 10 times. Play against world champions in soccer corner-kick style tournament. Use arrow keys and space-bar to kick and catch the ball. There are 2 modes of play in this game, the Offence and the Defence mode. The play mode changes every turn. I recommend You to go through tutorial in the game. Play one on one soccer against a professional! Drag mouse in direction you want your player to run. While holding down mouse button, move the mouse to point the ball in the direction you want it to go. Release button to kick. Ever fancied testing your football skills against one of the world’s foremost talents? Well now you have the chance! Legendary 70’s football hero Vick Piectrum, is taking on all challengers as part of his training schedule for the “World Cup Seniors” tournament. Use the up and down cursor keys or your mouse to move up and down. To move forwards or backwards use the left and right cursor keys. Try to score as many penalties as you can. Someone passes you a ball and you only have to choose a direction. If you are a good player, another club will want to buy you. Use your mouse to control the game. 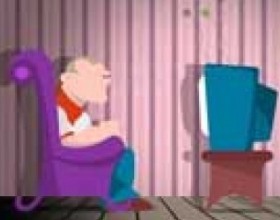 Your objective is to make a ball hit the walls as many times, as you can. Use your mouse to control the game. Click one the ball and don’t allow it to jump aside too far from the wall. Try to achieve your best record in this game! 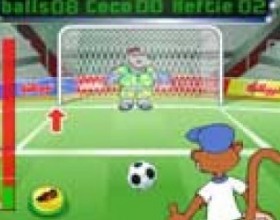 Moving your mouse left and right to reach the ball head it back and forth to the guy at the top for points only consecutive headers build up yours score. Good Luck! Keep the ball moving – don’t let it go ‘out’ or you’ll lose a ball! You start with 3 balls. 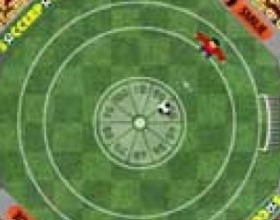 Score to gain points – the score wheel indicates how many points you’ll get for a goal. Press S to toggle the sound. Press P to toggle pause. Good Luck! 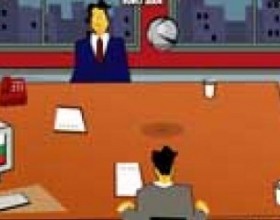 Move the player inside the half-circle with the mouse and click to shoot. You have 10 tries to score at all the 9 levels. Have fun! What to kick free throws like David Beckham? try it! 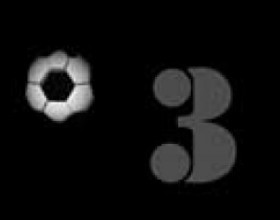 The object of the game is to make 3 goals from various points on the field as fast as you can. Click and hold on the ball and a red arrow will appear, you can aim your shot by moving your mouse which moves the red arrow. Try to have as many keep-ups as possible by hitting the jumping ball with the mouse-pointer, but be careful . When the ball hits the ground your points counter resets. You can always submit your best score during the game by pressing the ''Submit Score'' button. Have fun! Game is to score as many free-kick in a row as you can. The more you score, the harder the game will get. See how many you can score in a row, and then challenge your chums to beat your score. 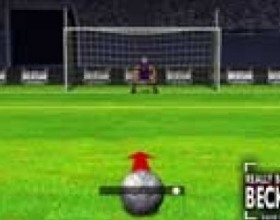 Set the power level to ensure it manages to reach the goal and beat the goalkeeper. Click „SET” to choose the strength of your shot. This funny monkey is playing football with a hippopotamus. You have to kick the ball right into the goal. Choose the trajectory and power by moving and clicking your mouse. Good luck in this sport game!